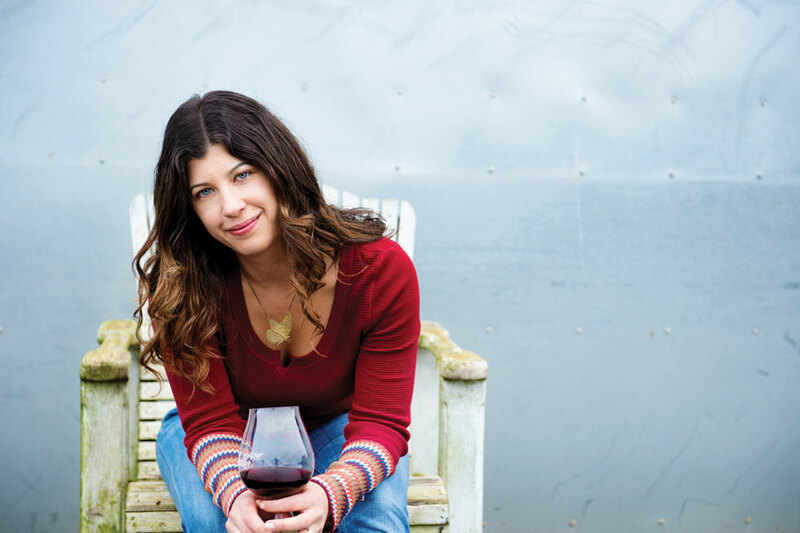 Head to Oregon to revel in pinot noir – and be pleasantly surprised by the young winemakers who dabble in other varieties. By Mike Haverkate, Andrea Johnson, Serge Chapuis, Caroline Wells-Kramer, Lingua Franca, Cristom, and Robert Holmes. Oregon’s Willamette Valley in autumn is beautiful. No, scrub that – it damns the scenery with faint praise. The Willamette Valley in autumn is breath-takingly, stunningly, beguilingly beautiful. Misty low-lying clouds part to reveal a gently rolling landscape of folds and valleys forested with evergreen firs and deciduous trees whose leaves have turned lambent shades of gold, scarlet, terracotta, blush, copper, ochre. America’s east coast states may get all the glory when it comes to autumnal foliage displays, but this part of the Pacific Northwest certainly gives them a run for their money. This bucolic paradise is farming country, famed for the quality of its hazelnuts and cranberries, its grasses, Christmas trees and hops – little wonder that Portland is at the epicentre of America’s craft beer scene. Wine lovers will recognise the Willamette as the source of some of the U.S.’s most refined chardonnays and pinot noirs. They may, however, be surprised to learn that it wasn’t until the mid ’60s that the first pinot vineyards were planted in the valley, and another decade at least until the quality of the wines produced there was widely recognised. Unlike neighbouring California, whose viticultural history dates back to the late 18th century, Oregon was long believed to be too cold and damp to be a successful grape-growing region. Tom Gerrie and Steve Doerner of Cristom Vineyards. As it turned out, the Willamette offered near-ideal conditions for making refined wines from Burgundian grapes, which is ironic, considering that at least some of the valley’s first growers were actually looking to Alsace for inspiration. It wasn’t long, however, before they began to recognise how well suited their region was not only to nervy, picky pinot, but also to its Burgundian compatriot, chardonnay. Part of the success of these two grapes can be ascribed to Oregon’s hilly topography and its climate, which combine to create a variety of cooling influences that gift freshness and aromatic density to the wines made in the state. 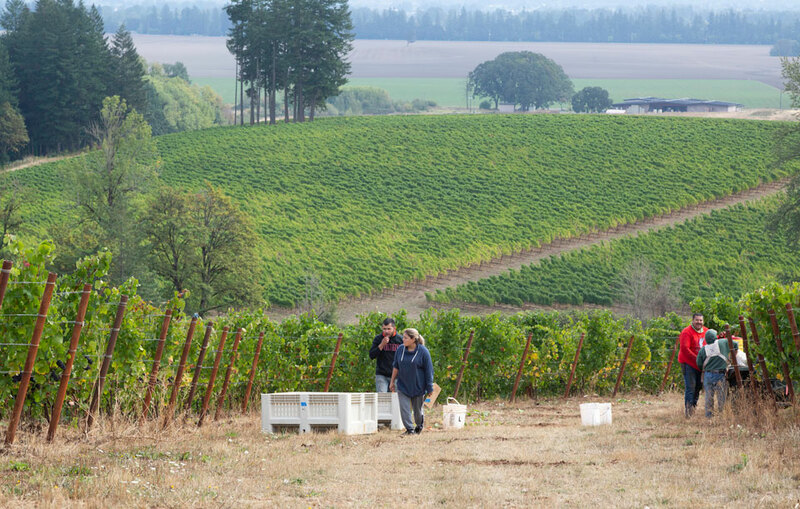 Rain falls abundantly on the Willamette, mainly in autumn – a fact that occasionally creates a conundrum for winemakers when it comes to choosing suitable harvest dates – ensuring the soils contain just enough water. Summers tend to be long and sunny, allowing the grapes plenty of time to ripen, but cool night-time breezes and a bit of altitude – most vineyards are planted at around 110-330 metres above sea level – assist in creating a sense of vibrancy and tension in the wines. In recent years, however, the climatic cycle has posed a series of challenges to growers. The 2014 and 2015 vintages, in particular, were marked by hot, dry growing conditions, thanks to swings of the El Niño/La Niña cycle. In 2013, a typhoon struck just as harvest began, profoundly affecting vignerons, and only those winemakers who were rigorous about their selections made good wines. Luckily, the valley escaped much of the smoke taint that affected Oregon’s southern wine regions in 2017, and 2018 also looks promising. The best vineyards are grouped in a series of American Viticultural Areas (AVAs) that lie about an hour’s drive south of Portland, and are clustered within a few miles of the Willamette River. They’re planted on the foothills of the Coast Range, which provides protection from the worst of the storms that blow in from the Pacific. To the outsider, the differences between the AVAs of the Chehalem Mountains, Dundee Hills, Eola-Amity Hills, McMinnville, Ribbon Ridge and Yamhill-Carlton, as well as the eponymous Willamette Valley, are subtle. There are small variations in terms of altitude and Pacific influence, but the three main soil types of the region are fairly widely distributed across the AVAs, with minor variations. The soils of the Dundee Hills are mainly based on volcanic basalt, while Ribbon Ridge features a predominance of marine sedimentary clays. By and large, though, these two soils, sometimes with an additional dusting of wind-blown loess, are spread throughout the valley. Many of the Willamette’s pioneering winemakers had escaped to Oregon as part of a counter-cultural lifestyle decision. Their aim was not only to plant vineyards but also to raise their families at a distance from America’s fast-paced consumer rat race. An echo of their homespun, down-to-earth ethos still pervades the valley. There’s little of Napa’s gloss in downtown McMinnville, the town situated in the heart of Oregon wine country; the Willamette is not a place for trophy wives in designer frou-frou or shiny chauffeur-driven Cadillacs. 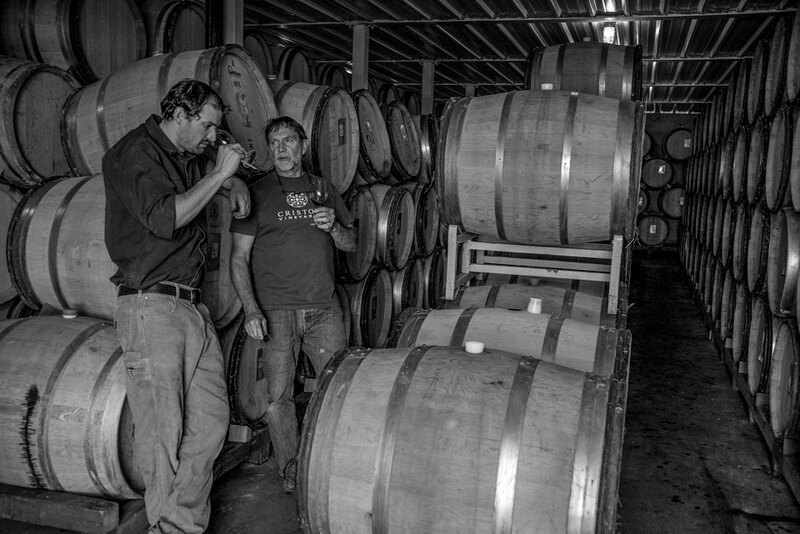 Most of Oregon’s winemakers get around in beat-up utes, wear heavy-duty workman’s boots and, as the weather cools in autumn, hefty plaid shirts are de rigueur. The guy who sells you the wine on your visit to the winery may well be the same guy who pruned the vines or hand-plunged the fermenting must. Many of the wineries are still fairly small in scale, although most of the pioneers have moved on, sold up or handed the reins over to the next generation. An initial trickle of outsiders has grown of late into a bit of a flood, and many wineries are now owned or backed by Californian and French companies. Philippe Drouhin of Domaine Drouhin. And winemaking itself is beginning to change in the Willamette. After some 40 years of critical acclaim for pinot and chardonnay, some wineries have shifted their focus back onto aromatic whites. Younger winemakers whose fingers are perhaps fixed more firmly on the pulse of sommeliers in the big cities of the Pacific Northwest and the East Coast are beginning to dabble in fashionably lightweight grapes like trousseau and gamay, aligoté and grüner veltliner. If you look closely, you might even find the occasional bottle of natural wine being made in the Valley, whether you define ‘natural’ as being based on minimal intervention, a touch of oxidation or skin contact or the use of extremely low levels of sulphur. Other winemakers are experimenting with fermentation in terracotta amphorae and other alternative vessels. Where once the Willamette had a clear, distinct message, diversity is now the name of the game for many. This in itself is not necessarily a bad thing, of course, but could entail problems when communicating to a wider audience of wine lovers. And there are further hints of trouble in pinot paradise. There’s just the merest suggestion big business, with its glossy marketing and its slick sales techniques, may have begun to encroach on this former stronghold of ascetic self-reliance. Likewise, this is not necessarily a bad thing, but land prices are rising as a result of increased demand. As they do, the kind of small-scale producers who created the Willamette dream are beginning to be priced out of the region. But just as seasons change, so too does the world; it is, perhaps, inevitable the nature of wine production in the Willamette should change with changing times. Stoller Family Estate Winemaker Melissa Burr. Tom Gerrie, a member of the second generation to own Cristom Vineyards (cristomvineyards.com), is a man deeply in love with his family’s vineyards. He strides up to the brow of a hill overlooking his family’s winery and points out subtle differences in soils and exposure that allows Cristom to carve out four distinctive vineyards, each named after one of the family matriarchs. The Eileen Vineyard, named after Gerrie’s mother, is the highest, windiest site, exposed to the Van Duzer Corridor, a gap in the mountains that allows cooling Pacific breezes to blow into the Valley. Jessie, Marjorie and Louise all lie beneath Eileen at varying degrees of altitude. Each of these vineyards has its own way of expressing pinot noir, teased out by Cristom’s long-serving winemaker, Steve Doerner. When I tasted there, my favourite was the 2016 Eileen Vineyard Pinot Noir, Eola-Amity Hills, which even at this early stage shows great vibrancy and perfume. Along with a mouthful of red cherry, tea leaves, violets and raspberry, the Eileen has very fine tannins and bright acidity, as well as pinot’s hallmark silky texture. Nicely balanced, with real depth. Visitors who book the ‘Cristom Experience’ tasting will get a chance to work out which one of the matriarchs they prefer during the course of a hosted tasting. Alternatively, you could opt for a seasonal flight of five wines or a fully catered picnic in the vines. A short drive brings you to the front gates of one of the Willamette’s newest wineries, but one that’s already making waves. It’s little surprise that Lingua Franca (linguafranca.wine) is being widely feted both in the U.S. and overseas – one of its founders is Larry Stone MS, an influential American sommelier, and its consulting winemaker is Dominique Lafon, a scion of one of Burgundy’s foremost winemaking families. The day-to-day running of the winery is handled by an accomplished young French winemaker, Thomas Savre, who oversees a small team as they go about making a small range of refined, poised wines. At the moment, visitors are received in a safari tent to the rear of the newly built winery, but only by appointment and at set times of the day. Nevertheless, it’s worth adapting your schedule to accommodate a tasting here. The 2016 Bunker Hill Chardonnay, Willamette Valley, uses grapes from a 26-year-old vineyard grown in the extreme southern fringes of the Eola-Amity Hills on shallow volcanic soils. This is a subtle, elegant wine with notes of smoky minerality, mandarin zest and a hint of ginger, enlivened by resonant acidity and enough oak to lend structure and weight without being obtrusive. Of the pinots, the 2016 Hope Well Vineyard, Eola-Amity Hills, was the standout. Fine-boned tannins provide a framework for layers of perfumed flavours – dried rose petals are succeeded by hints of sandalwood, dark cherry and elderberry. The finish is long and fresh, and the overall impression is one of airy weightlessness, although it’s clear this is a wine with enough power and presence to age. 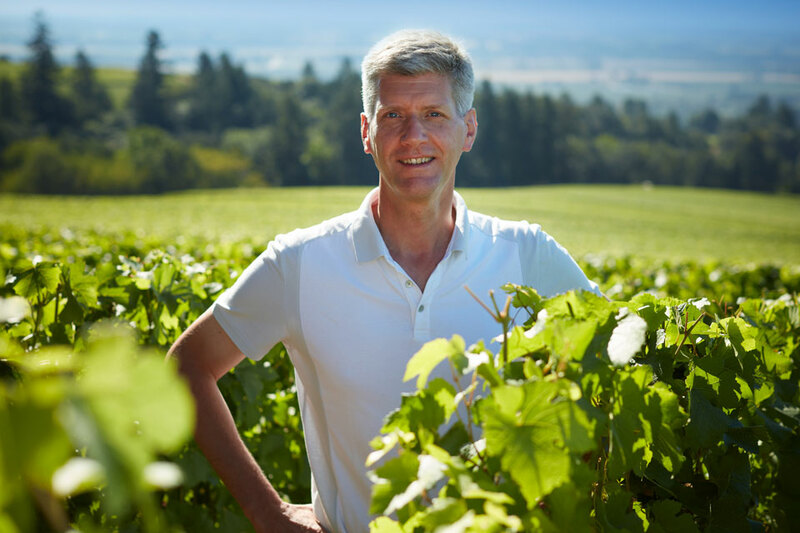 The first Burgundian winemakers to put down roots in the Willamette Valley back in the 1980s were members of the Drouhin family. Véronique Boss-Drouhin still commutes between France and the U.S. every vintage to oversee production at her family’s winery in the Dundee Hills. Domaine Drouhin (domainedrouhin.com) is housed in an unassuming building perched on a hillside planted with 50 hectares of high-density vineyards. 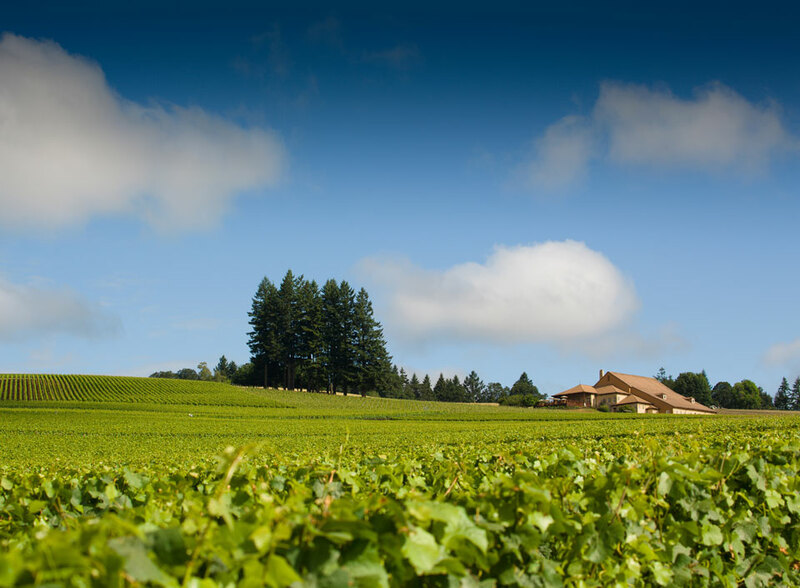 Pinot is very much king of this particular hill, but the range includes some chardonnay too, and the Drouhins also own vineyards in the Eola-Amity Hills, where they make wines bottled under the Rose Rock label. Unsurprisingly, the Drouhin wines have a hint of Burgundian elegance about them, combined with the bright fruit that comes from the sunshine which bathes the vineyards during the long New World ripening season. It’s fun to taste the Louise and Laurène cuvées side by side. The 2015 pair of estate pinots, named after Boss-Drouhin’s daughters, show slightly different characters. Laurène has an ethereal, perfumed quality, albeit with a ramrod-straight spine of tannins beneath all its pretty red fruit and rose flavours. Louise shows a bit more grip up front, and a complex, smoky palate with notes of spiced plum and dark berries. Many of Oregon’s wineries are based in McMinnville, and The Eyrie Vineyards (eyrievineyards.com) tasting room is an absolute must-visit for anyone wanting to get to grips with the Willamette’s past, present and future. In 1965 David Lett planted the first pinot noir vines in the Willamette Valley. Lett’s winery – Eyrie, named for the nests of the local red-tailed hawks – was among the first to fly the flag for Oregon pinot. Working alongside his wife, Diana, Lett managed his vineyards and winery in a manner that showed respect for the environment long before the words organic or sustainable became a talking point for marketeers. These days, Lett’s son Jason runs the show and his considered, thoughtful approach is derived directly from the values he learned from his parents. 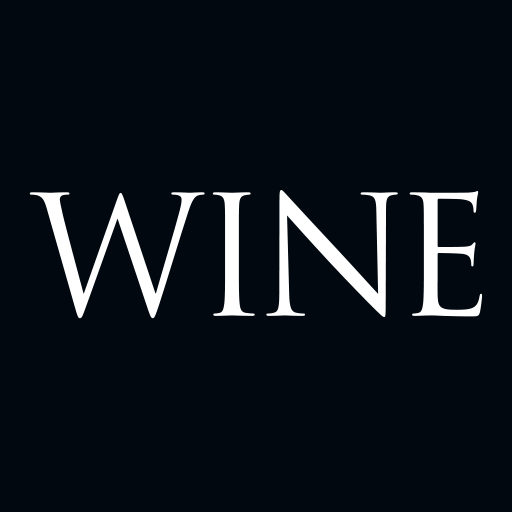 The Eyrie wines are an eclectic collection that includes more than a few surprises. There’s plenty of pinot noir and chardonnay, of course, but you might not be expecting the floral, peppery 2016 Trousseau or the 2014 Melon de Bourgogne, an ‘orange’ wine that spends three years in barrel on lees. The result is a drink that’s got plenty of slippery texture, nuttiness and subtle notes of orchard fruit. More conventionally, the 2015 Daphne Pinot Noir, which is grown on volcanic soils, is linear and spicy, with great purity of cherry and plum, a hint of smoky minerality and gently grippy tannins. Definitely one for the long haul – and, talking of which, it’s worth asking during your visit whether they’ve got one of their old vintages on tasting that day. I tried the 1985 Eyrie Vineyards Pinot Noir and was blown away by its freshness and energy. The Craft Wine Company (craftwineco.com) is another urban winery, situated in the small town of Carlton. It’s located in an industrial warehouse and produces wines under three labels. Omero Cellars, the original brand, is all about approachable, easy-drinking wines. Minimus was set up in 2011 by winemaker Chad Stock, who wanted a label for wines based on unusual grapes, an eclectic range of fermentation vessels and some experimental winemaking techniques. Origin, as the name suggests, is all about highlighting the individual character of specific vineyards. Depending on what’s available at the time of a visit, you might find yourself tasting grüner veltliner, aligoté, vermentino, syrah or gamay, not to mention several distinctive cuvées of pinot noir or chardonnay, and a range of blends. Despite the eclectic nature of the line up, I was particularly taken by the elegant, focused 2016 Dijon Free Chardonnay. The name refers to the fact Stock was keen to use later-ripening clones with a low pH – pretty much anything grown in the valley other than Dijon clones – to make this wine. The result is a wine of great freshness and aromatic complexity, with notes of tangerine, white peach and ginger spice, enhanced by a touch of oak. ‍Stoller Family Estate (stollerfamilyestate.com) combines Willamette tradition with some of the valley’s new-wave marketing tricks. Founder Bill Stoller worked alongside Willamette pioneer Harry Peterson-Nedry at the Chehalem winery from 1993 onwards, buying Peterson-Nedry’s share of the business in 2018. However, at the same time as he joined Chehalem, Stoller also bought his family’s ancestral turkey farm from his cousin. At the time, the land was considered to be marginal in terms of its ability to grow crops, but Stoller recognised the 137-hectare property was based on the valley’s volcanic soils, and began planting vineyards. The environmentally friendly winery currently makes somewhere in the region of 20 different wines, most of which can be tasted in the 400-square metre tasting room, whose floor-to-ceiling windows open out over the vineyards. Cheese and charcuterie platters are available, although if you’re really hungry – and fancy a more in-depth tasting – you might want to book yourself in for the gastronomic tasting and tour. The latter features a tour of the winery followed by a tasting and lunch in the library, in which wines are paired with dishes prepared from local ingredients. Ask to try the 2015 Helen’s Pinot Noir, Dundee Hills. Named after one of Stoller’s aunts, the wine is fleshy and voluptuous, but features enough juicy acidity and generous tannins to support the opulent black cherry and baking spice fruit. If you’re impressed with Stoller, you may want to check into one of the estate’s guest houses. Three pretty cottages are dotted among the vineyards and offer comfortable accommodation for small groups. If you want to stay in town, within walking distance of restaurants, shops and bars, McMinnville is your best bet. The best hotel in McMinnville, hands down, is the Atticus Hotel (atticus hotel.com). Although it was purpose-built and only opened in early 2018, the Atticus Hotel has the cosy, settled feel of an establishment that’s been providing Willamette Valley visitors with a luxurious home away from home for years. Rooms are well equipped, and staff are friendly and helpful. They’re particularly keen to help visitors explore Oregon wine country, and are more than happy to advise on winery visits and tours. The go-to place for breakfast or brunch is the Valley Commissary (valleycommissary.com). Generous portions of frittata or home-made pastries help prepare for a hard day’s tasting, and the coffee’s pretty tasty too. The Brooks Winery & Tasting Room (brookswine.com) is a relaxed place to hang out at lunch time and enjoy a sandwich or a salad, along with a glass or two of the winery’s famous rieslings. Brooks is also famed for its live music Sundays and pizza Fridays, as well as a varied calendar of events (check website for details). McMinnville has a surprising number of restaurants for a small town, but the pick of the bunch for dinner has to either be Nick’s Italian Café (nicksitaliancafe.com) or Thistle Restaurant and Bar (thistlerestaurant.com). The former is the place to go if you’re in the mood for wood-fired pizzas and generous portions of hand-made pasta, while the latter offers classy cocktails and an on-trend menu of small plate dishes with intense flavours.